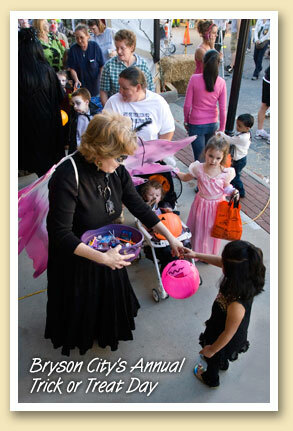 Robin Montieth hands out candy at last year’s Trick or Treat Day, the annual Halloween event where hoards of costumed children invade downtown Bryson City (now that’s scary!). This year, on Monday October 31, the town will again close off Everett Street at 3:30 and turn the two-block area over to the kids. There’ll be prizes for the best costumes. Merchants will provide the treats. And if this year is anything like last — the largest turnout in the history of the event — the trick will be not running out of treats. Three and a half miles north of the Oconaluftee Visitor Center, a right turn into Smokemont will lead to a campground and horseback riding stables. But hidden in the trees there’s also a white chapel, the lone remaining structure from a once-thriving Smokemont community. 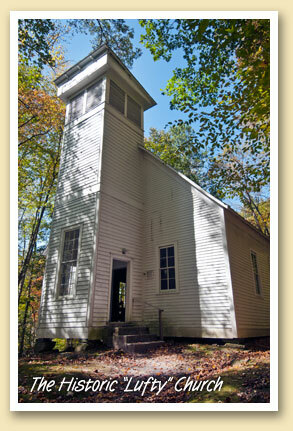 The Baptist church, sometimes referring to as Lufty Church (short for Oconaluftee) was formed around 1829, but the current building was erected in 1896. Like all of the Park’s surviving old buildings, the church’s doors are always open. Originally called Bradleytown, the town of Smokemont became the headquarters for Champion Fibre Company’s massive logging and sawmill operation in the early 1900s. At the time, Champion ran the world’s largest paper mill in Canton, North Carolina, a mill that’s still running today. Smokemont had homes, businesses, a school, the logging mill, commissary, a club house, and even a hotel. In the early 1920s, the sawmill produced 45,000 feet of lumber and pulp wood per day. Mountain Biking in the Smokies. What Other Kind is There? The first Saturday of October every year has been named Take A Kid Mountain Biking Day by the International Mountain Bike Association (IMBA). IMBA, along with the National Park Service and other sponsors organize the event, and this year over 200 events were hosted nationwide. 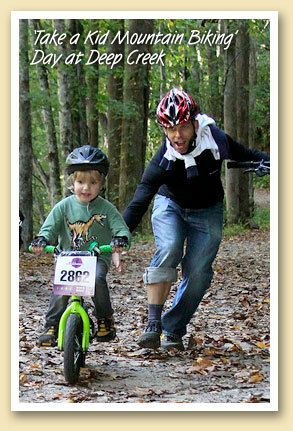 Bryson City Bicycles hosted the local event at the Deep Creek area of the National Park. Fourteen local kids braved the chilly October morning to take the ride along Deep Creek. Ranger Doug talked to the group about his police bike, wildlife in the park, and how to treat the park with respect. After the ride, kids participated in bike riding games like paperboy, slowest rider, cone slalom and stop on a line. The day wrapped up with prizes and snacks. Swain County’s history chronicles a number of tragic deaths — like poor Andrew Jackson Lambert, who on July 9, 1886 became the only man to be hanged in Swain County. He was an innocent man. Lambert is one of the seven ghosts that haunt the woods beside the Tuckaseegee River in Whittier. Tim “the storyteller” Hall relates each of their stories (all true) on his “Tuckaseegee Terror Tales Tour”, a spooky covered wagon ride through those Whittier woods. Tim normally spins yarns at his Storytelling Center of the Southern Appalachian on Everett Street in Bryson City. 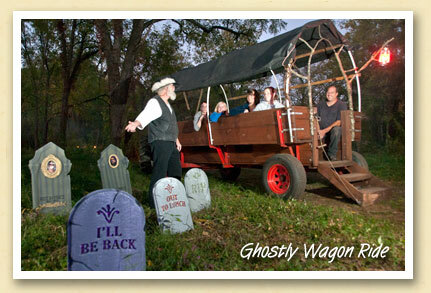 But in the spirit of Halloween, he’s offering the ghostly wagon rides in Whittier every Thursday, Friday and Saturday evening in October. The rides ($5) begin at 7 pm and last about 30 minutes. For more information, call 828-488-5705 or check out Tim’s Facebook page. When These Nice Ladies Put On The Skates, Watch Out! By day they may be a doctor, a beekeeper, a beautician, a rafting guide or a bike shop owner. But give ’em a pair of skates and they’re suddenly transformed. With names like “Bletilla The Hun”, “White Crash”, Hopi wan Kenobi”, “Butternut Squash” and “Miss Guidance”, the newly formed Smoky Mountain Roller Girls are well on their way to forming a local roller derby league in Bryson City. 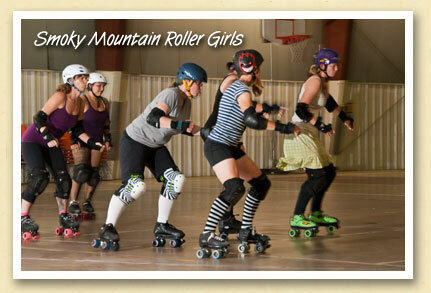 Smoky Mountain Roller Girls is open to women 18 and up, with skill building opportunities for all levels. The Roller Girls have extra skates and gear for those interested in trying, and are happy to help build skills. For more information, come to a practice (with or without skates and gear), join the group on Facebook, or send an email to smokymountainrollergirls@gmail.com. The group practices four evenings a week from 6:30 to 9:00. On Tuesdays and Thursdays they’re at the Stecoah Valley Center gym; and on Wednesdays and Sundays they’re at the Swain County Indoor Recreation Center on West Deep Creek Road.